Tired of living in his brother’s shadow, Brody Galven wants the folks of Meeteetse to realize he’s no longer a bad boy screwup. He also wants his childhood best friend, Olivia Langston. While staying out of trouble proves impossible, admitting he loves her is out of the question…even when she’s about to walk out of his life forever. Former trick rider Ava Wallace works the five-thousand-acre McKinley ranch and loves the man who owns it. Only trouble is, they’ve been living together for over seven years, and she can’t help but think things have changed between them. Her rough and tough cowboy used to be relentless with his affection, unable to keep his hands off her. Now, he barely has the time. Cowboy cattle rancher Jonas McKinley can’t seem to catch a break. Between his hard-working live-in girlfriend feeling like they don’t connect, and the nuisance grizzly that keeps tormenting his livestock, he must overcome the troublesome challenges that threaten his lucrative family farm before he loses what he’s worked so hard to keep. 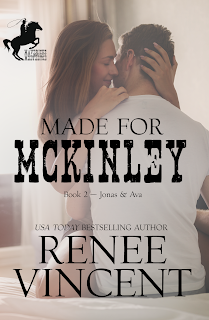 Faced with a difficult choice, Jonas has to decide what matters most: Ava or his ranch. Best friend and fellow cowboy cattle rancher Cole Forester likes things the way they are—quiet, no-frills, and uncomplicated. He’s a glorified bachelor with only a dog as his companion, totally content to live a solitary life next to the McKinley ranch. That is until a cute little barrel racer shows up looking for a job as a ranch hand. 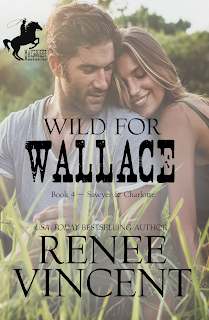 Tomboy Crys Willingham hangs up her rodeo hat and heads to where her friend Ava Wallace lives, hoping to score a job that doesn’t involve the risk of broken bones every time she mounts up. Once she lays eyes on Cole, it’s her vulnerable heart that’s in danger of breaking. College graduate Sawyer Wallace has just come home to Meeteetse to visit with family. Excited to put his new degree to good use, he lands a comfortable job at the McKinley ranch until he can find something better. After a fluke horse accident on his watch, he calls Doc "Charlie" Peterson to the farm only to find the highly-praised vet is a woman. Even better, she’s an eligible, spicy little brunette with a jacked-up truck. Charlotte Peterson is the only veterinarian in Meeteetse, taking over her father’s practice after he retired. Traveling from ranch to ranch doesn’t leave her much free time. So when the new manager of the McKinley ranch calls her to care for an injured horse, she has trouble trying to convince the handsome “greenhorn” that she has little patience for his charming antics, much less time to date. While she’s determined to dodge Sawyer’s every advance, she finds that some things can grow wild without cultivation.